Georgie Demir has been nominated for The Bridge Create Change Award. Ocean Grove’s Georgie Demir has been nominated for The Bridge Create Change Award in the 2019 Seven News Young Achiever Awards. 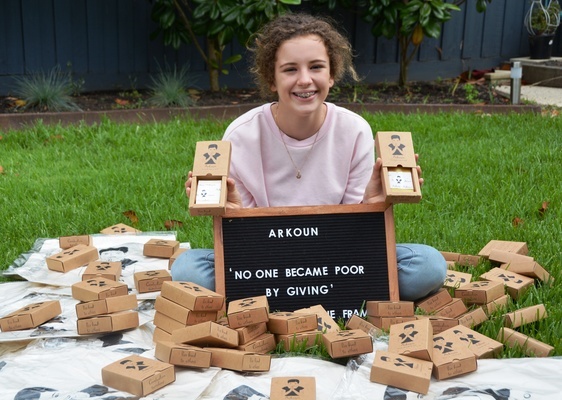 Georgie has been nominated for her work in creating a social enterprise, Arkoun, to raise money for the construction of wash stations in Cambodia. In the last 12 months Arkoun has raised enough money to build the first wash station. The City of Greater Geelong used Arkoun as an example of design thinking to address social issues at the launch of the UNESCO Geelong City of Design launch event in 2018. Georgie, 14, set up Arkoun after a trip to Cambodia with her mother where she saw the impact of a lack of sanitary washing facilities on the health of young people in the villages she visited. Arkoun means ‘thank you’ in Khmer. Profits from the sale of Georgie’s Arkoun soaps and bamboo toothbrushes help fund the building of wash houses in Cambodian schools. Judging for the award will commence on 6 March. Finalists will be presented and winners announced at an awards gala presentation dinner on Friday 10 May. Category winners will each receive $1000 into an account in their name from Bank of Melbourne plus a $1000 Bartercard account from Wheelton Philanthropy and Budget Rent A Car and a trophy. The Victorian Young Achiever of the Year will receive a $2000 Jetstar flight voucher.